In this article, you'll find 10 great looking and functional vegan wallets for women. We've listed out a variety of colors, styles and materials that you're going to love. The old-fashioned telephone print sets this adorable wallet apart. Simple with two card slots. Advertised as vegan: No, but it's made of polyurethane. Pros: If you're looking for a different kind of wallet, this one certainly fits the bill (no pun intended). It'll hold your cards and cash without taking up too much space wherever you stash it. Cons: It's a little on the small side. This sleek bifold wallet in coffee brown vegan leather is advertised as having RFID-blocking technology to protect your private information from remote scanners. Holds all your cards with 18 card slots plus a clear ID section. Secured with a silver zipper and stylish button latch. Pros: For a fairly basic but highly functional wallet, it's quite fetching with white contrast stitch accents. If you find your current wallet overflowing with plastic and loyalty stamp cards, this one might be a practical buy. Cons: We can't attest to how effective the RFID tech is. If you love all things shiny, this Wild Fable metallic purple wallet from Target might be what you're looking for. Designed with pebble texture faux leather. 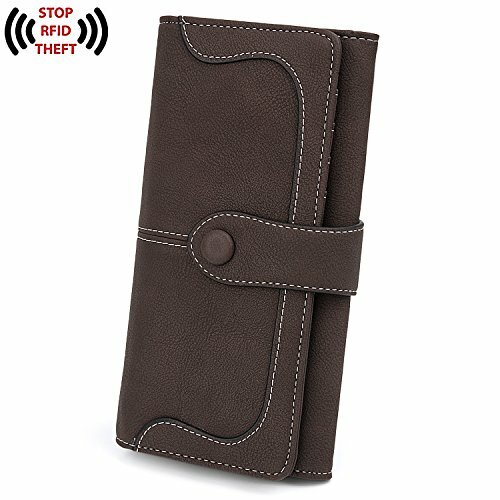 Holds your cash, cards and phone in separate pockets. Zips shut and secures around the wrist with a detachable wrist strap. Advertised as vegan: No, but the material is PVC. Pros: It's pretty! As for where it falls on the utilitarian to glitzy spectrum, we'd say that it settles smack-dab in the middle. It's not so fancy that you can't use it on the daily, but it's far from plain. 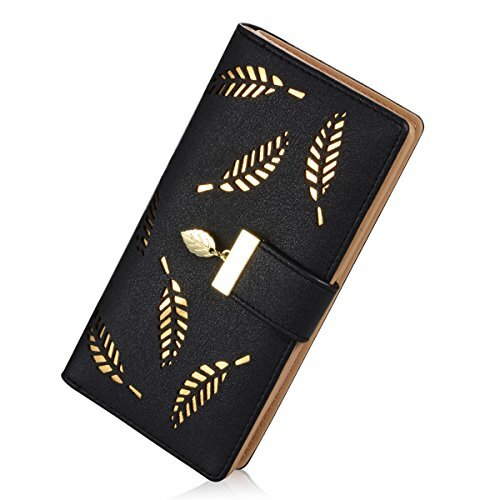 Cons: It might not hold a larger cell phone like a Samsung Galaxy W.
Made of eco-friendly leaf leather, this supple, water-resistant wallet highlights the natural beauty of leaf patterns. Features individual slots for cards and cash. The company claims to plant 10 trees for every sale. Pros: Bulky wallets can be difficult to manage. This one is super slender and really unique. It actually looks like a hybrid of leather and leaves, though it's totally vegan and sustainable. Cons: If you need a fair amount of organization, this wallet might not have what you need. Weighed down by all the coinage at the bottom of your purse? This dual faux snakeskin coin wallet in contrasting red and yellow will clean up the overflow. Constructed with two main compartments with shiny gold zippers. Designed with a conveniently attachable metal ring. Pros: The compartments are actually decently sized. Between the colors and the snake print, this wallet is striking. Fill it with anything from quarters and cards to hair ties and lip balm. Cons: As a wallet, it's fairly free-form, so you may not be able to keep your items separate. Keep your money and your phone together with the Vans Multi Task Wallet in iridescent rainbow faux leather. Designed with card slots, an inner zip pocket and a cellphone pocket. Comes with a removable wristlet strap. Advertised as vegan: No. However, it's 100% polyester faux leather. Pros: The holographic material is hypnotizing. It should be large enough to fit all your cards and cash plus most standard size cellphones. 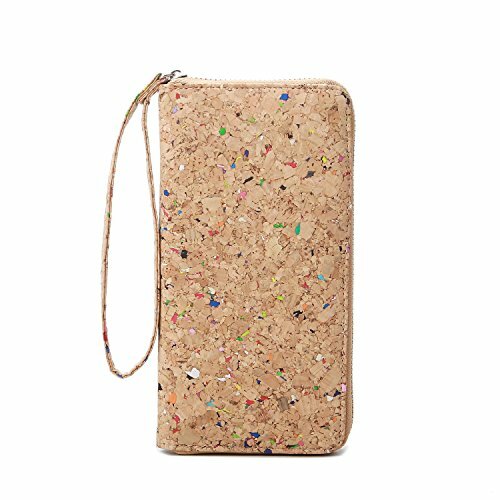 Cons: Could be problematic if you have a large cellphone—this wallet is 4" H x 6.5" W.
This fun wallet is made of vegan cork and peppered with multicolor flecks like confetti. Large with an outer zipper, an inner zip pouch and multiple card slots. Made with a wrist strap for easy carrying. Pros: Cork is a fabulously sustainable material, and it has an interesting look. This wallet is anything but boring with its bright bits of color interspersed with the natural cork. Cons: None that seem glaring. Part of Matt & Nat's vintage collection, this wallet is classy with minimalist appeal. Constructed with 5 outer card slots for quick access. Secured on top with a zipper. Advertised as vegan: Yes. Matt & Nat makes vegan accessories. Pros: The ability to grab your cards or ID without having to dig is a bonus. Overall, this wallet is pretty slick. There's a reason vintage style never fades. Cons: It's marked as "final sale," so it's non-returnable. Though it's made to mimic genuine leather, it's actually made of black faux leather with stylish cut-out leaf patterns in glittering gold. Fastens with a matching gold metal clasp. Super organized inside with a zippered compartment, card slots and an accordion pocket. Pros: No Costanza wallet for you. Put everything in its proper place. With a clear ID spot, layered card pockets and ample cash space, you can probably fit all your wallet accessories plus your phone. Cons: Some reviewers mention that you need to be careful not to let your cards sink too deeply into the slots or else they become difficult to retrieve. The RFID Audrey Wallet from Vera Bradley is made of high-quality microfiber vegan leather in stunning electric blue and quilted detail. Made with two compartments, 12 card pockets, a zippered pouch and two roomy cash areas. Advertised as vegan: No, but it's microfiber material. Pros: For ladies who want a sturdy wallet with a contemporary feel, this Vera Bradley wallet is chic with just a dash of decorative quilting. The efficient card and cash arrangement inside ensures that your items won't get smooshed together. Cons: As with other RFID wallets, we can't speak to the functionality.